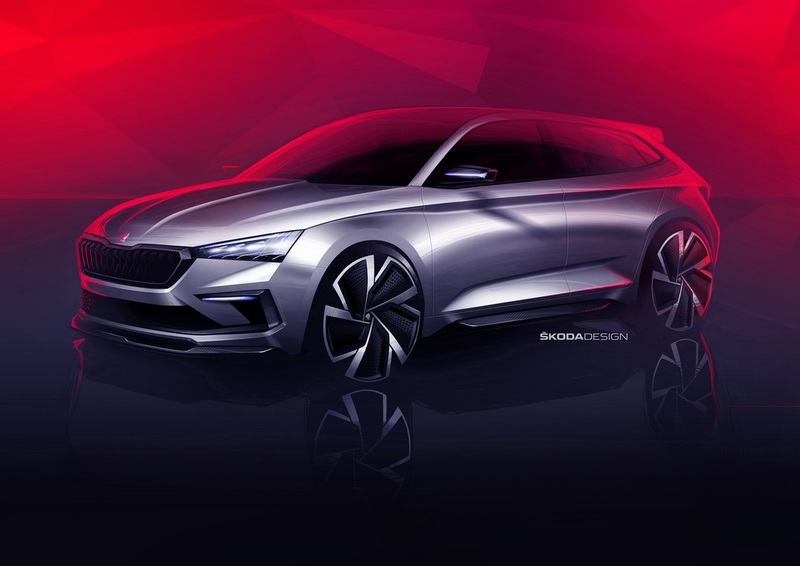 ŠKODA VISION RS, the new dynamic concept car, reveals design for next RS generation and a future compact car. With the ŠKODA VISION RS, the Czech brand combines its sporting tradition with a sustainable future. At the Paris Motor Show 2018 in October, the striking concept study – with its dynamic design language and efficient plug-in hybrid drive – provides the first insights into the next evolutionary stage of ŠKODA’s sporty RS models and the design of a future compact vehicle. 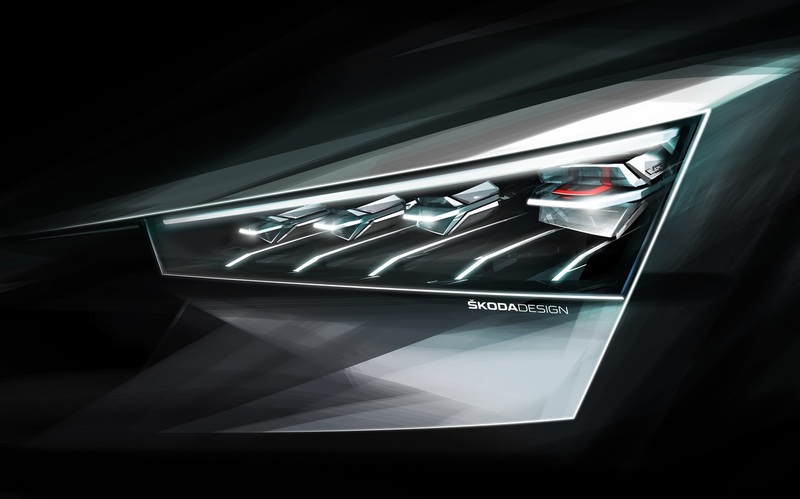 ŠKODA also demonstrates a high level of environmental awareness with the use of sustainably produced Vegan materials. Sharp lines. Smooth surfaces. Defined edges. The Vision RS is a clear nod to the racing genes it has inherited over ŠKODA’s 117-yr Motorsport history. Every exterior detail like the slim headlights, rear diffuser and the roof spoiler contributes to the car progressing like a bullet. The sporty DNA of the Vision RS finds a futuristic expression in the interior design. There’s carbon everywhere. The space frame design, seemingly floating seats and cut-crystal details make the racy intentions of the car clear from the onset. Xirallic crystal sparkle effect paint make the brilliant white finish of the ŠKODA VISION RS shimmer with a subtle blue effect. Numerous black carbon elements affixed to the body create distinctive contrasts to the white paint. The interior features material with a distinctive grain consisting of tiny triangles, carrying ŠKODA’s DNA into the brand’s future models. A carbon textile made from 100% recycled polyester thread is used for the upper part of the floating Alcantara® covered seats. The sports steering wheel with a distinctive centre marking - similar to those seen in motor racing. Xirallic crystal sparkle effect paint make the brilliant white finish of the ŠKODA VISION RS shimmer with a subtle blue effect. Organic components in the paint reflect heat, thereby reducing the interior temperature. Numerous black carbon elements affixed to the body create distinctive contrasts to the white paint. The high-tech material widely used in motorsport is featured in the redesigned radiator grille, front and rear spoilers, exterior mirrors, side sills, air inlets and outlets, and the rear diffuser. A carbon textile made from 100% recycled polyester thread is used for the upper part of the floating Alcantara® covered seats which bear signature Czech flags on their side bolsters celebrating Czechoslovakia’s foundation 100 years ago. Another example of sustainability are the floor mats which use Piñatex textile in a carbon weave; the high performance material extracts its fibres from the leaves of a pineapple tree. The sports steering wheel with a distinctive centre marking - similar to those seen in motor racing - has a centre pad featuring the same distinctive grain consisting of tiny triangles seen in the rest of the interior, carrying ŠKODA’s DNA into the brand’s future models. 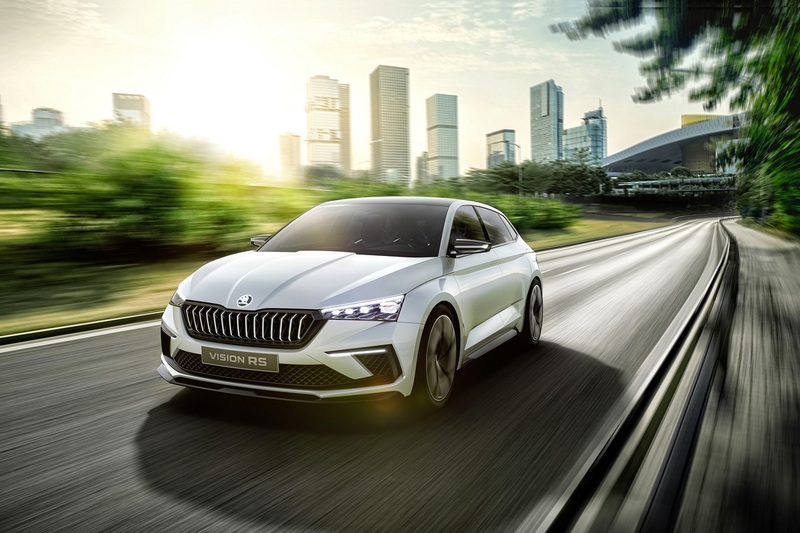 The ŠKODA VISION RS plug-in hybrid drive combines the 1.5-liter TSI with an output of 110 kW (150 hp) and an electric motor providing 75 kW (102 hp). They unite to deliver a system output of 180 kW (245 hp), which accelerates the concept study from 0 to 100 km/h in 7.1 seconds, making the intermediate sprint from 80 to 120 km/h in 8.9 seconds. In total, the compact athlete emits only 33g of CO2 per kilometre. On battery power alone, the model can cover distances of up to 70km, ensuring zero-emission local driving. The lithium-ion battery with a capacity of 13 kWh can be charged by cable in 2.5 hours at a charging station. 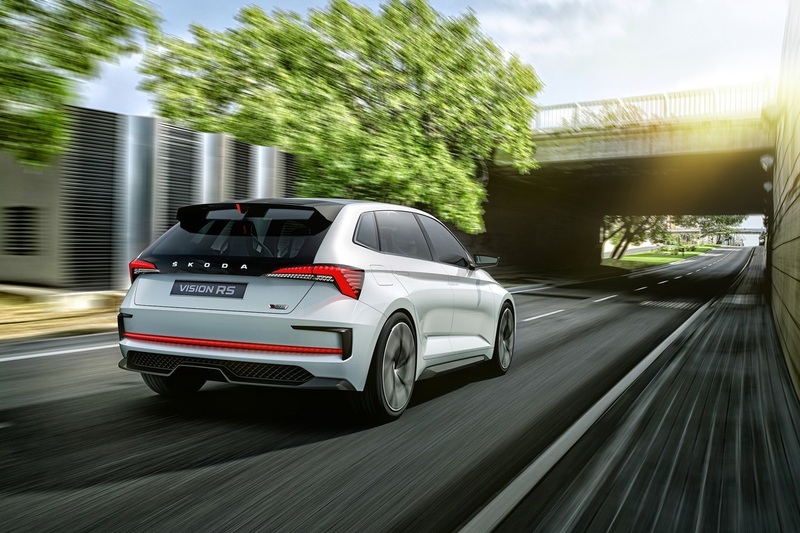 Alternatively, the ŠKODA VISION RS can be plugged into any household socket or charged while driving through energy recovery. 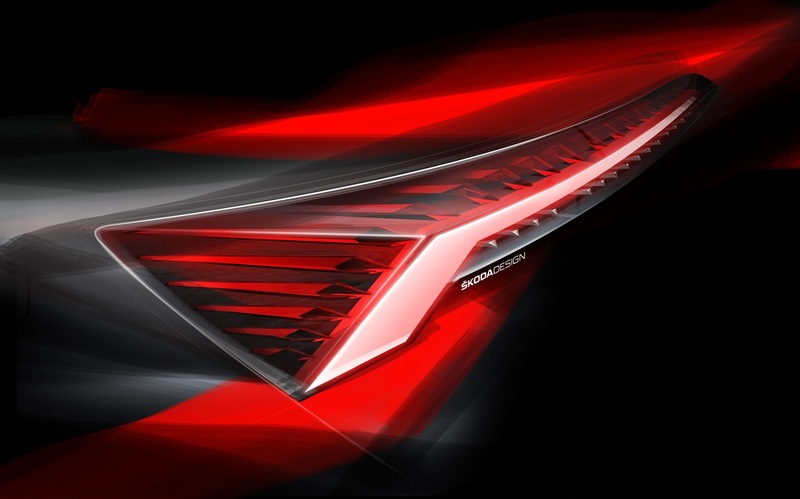 Even the rough sketches reveals that a key part of this vehicle concept is about aerodynamics. The front is precisely defined. With its slim headlights, it feels very dynamic. The rear is dominated by a diffuser and an aerodynamically optimised roof spoiler. 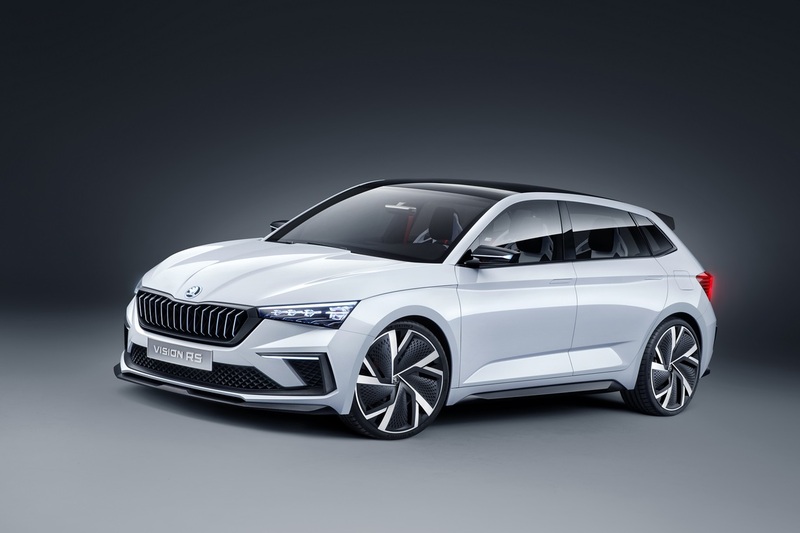 The ŠKODA VISION RS is 4,356 millimetres long and 1,810 millimetres wide, with a height of just 1,431 millimetres and a wheelbase of 2,650 millimetres. Incorporating clear motor racing references, this car conveys a taste of the next design phase of the RS performance models while building on ŠKODA’s 117-year-old motorsport tradition. The RS letter combination was first introduced in 1974 for the 180 RS and 200 RS rally sports cars. Following the success of the 130 RS, it became known all over the world. Since 2000, it has been used to identify the performance variants of various ŠKODA model series. The elongated instrument panel with carbon elements picks up the symmetrical contours of the radiator grille. The decor of the VISION RS consists of handmade and specially cut crystal from the Czech glass manufacturer Lasvit. 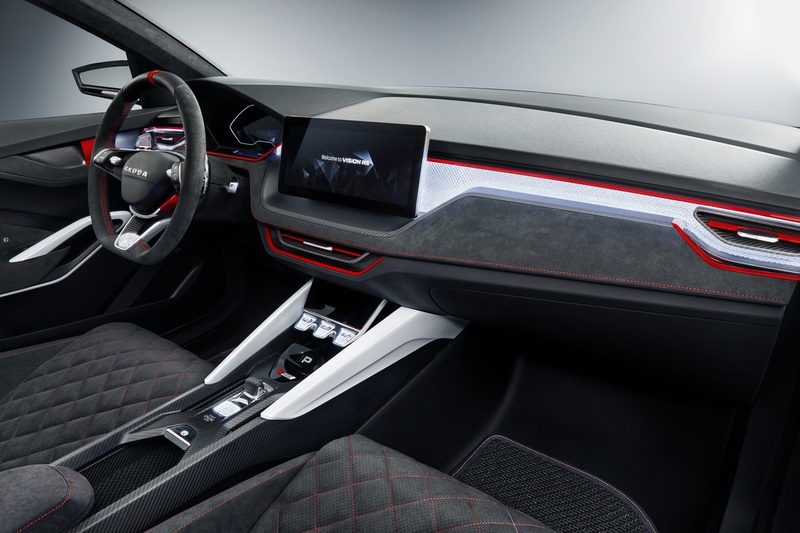 The instrument panel features special RS design animations and is illuminated by lighting effects that interact with the infotainment system touch screen. 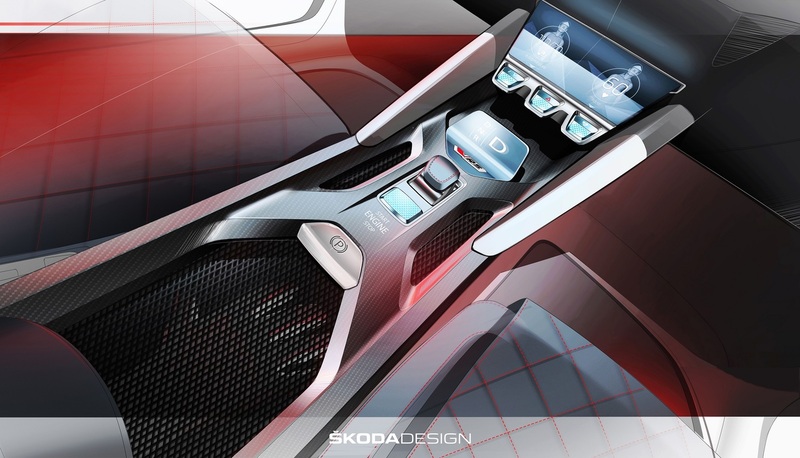 The centre console of the VISION RS in space-frame design with integrated shift-by-wire operation of the DSG is made entirely of carbon. Also used for the decorative elements, door panels and seats, this high-tech material creates a direct link to the world of motor racing. The special loop-shaped door handles are reminiscent of racing cars; storage compartments with elastic rubber bands are "simply clever". In addition to a sporty appearance, sustainability is another key element of the ŠKODA VISION RS. 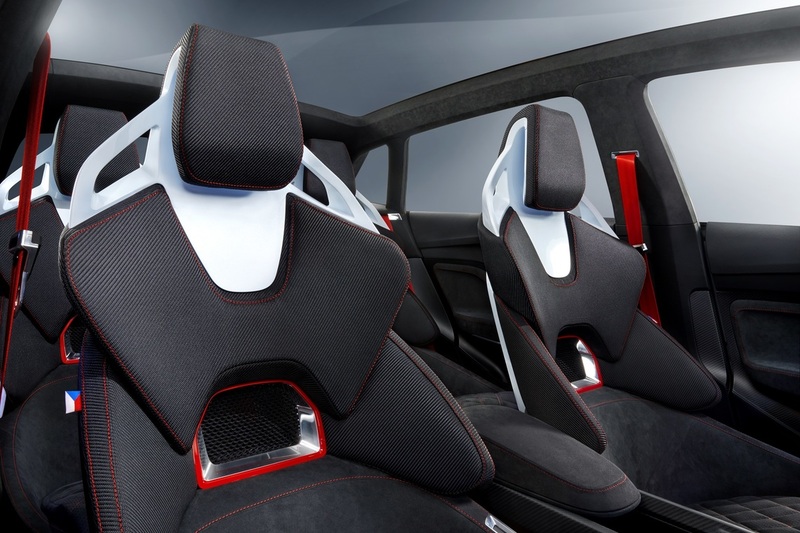 For example, the carbon fibres consist of 100% recycled polyester, with the seat covers made from vegan Alcantara. 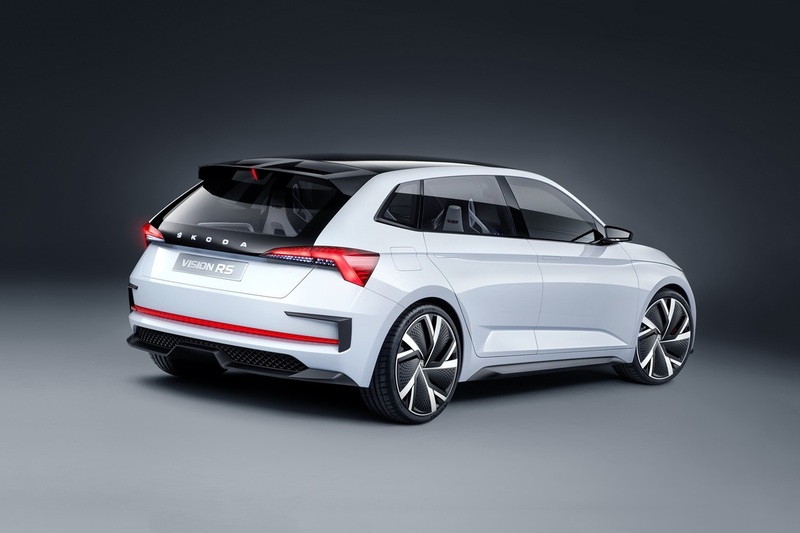 The ŠKODA Vision RS heralds a new generation of the brand’s compact cars. While modelling the car, the designers took a leaf from ŠKODA’s rich and racy Motorsport tradition. Take a look how tradition inspired the future. 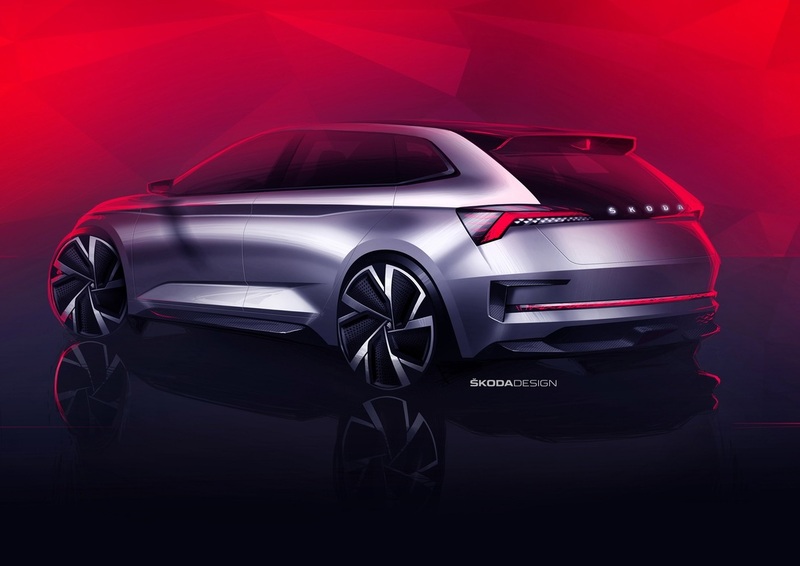 With deft strokes and inspired by the historic ŠKODA 130 RS rally car, a designer sat in the villa's courtyard sketches an athletic compact car on a tablet, with precise, flowing lines and distinctive contours – the ŠKODA VISION RS. The second video invites the viewer into the studio in the Czech capital, not far from Prague Castle, Charles Bridge, the Dancing House and Žofín Palace. 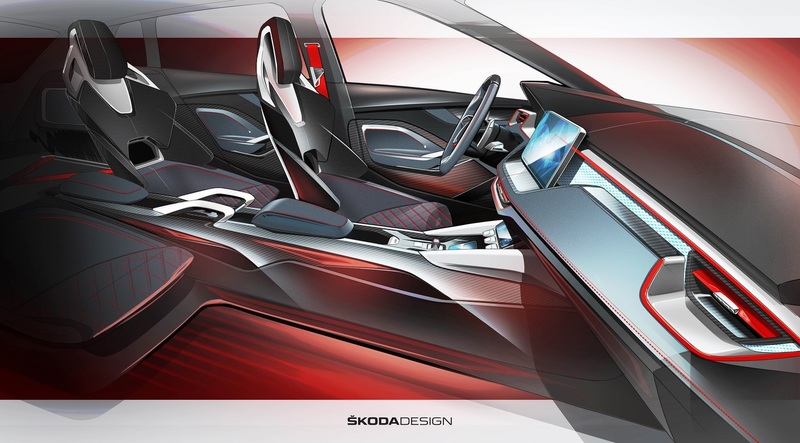 The first designs for the future ŠKODA models are not only being drawn up at the design studio in Česana / Mladá Boleslav, but also in the inspiring environment and atmosphere of a Prague art nouveau building at Masarykovo nábřeží. 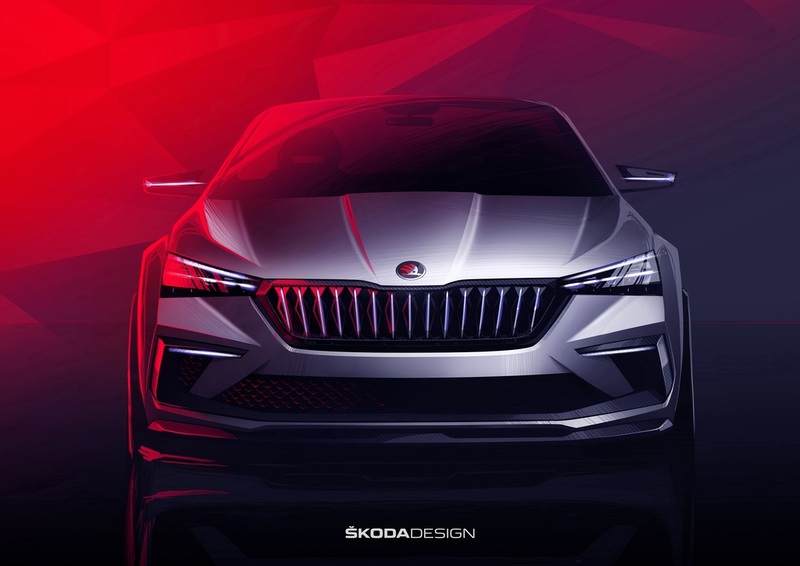 With the debut of the ŠKODA VISION RS concept at the 2018 Paris Motor Show ŠKODA will provide a first glimpse of a future compact car while ringing in the next design phase for its sporting RS model range.